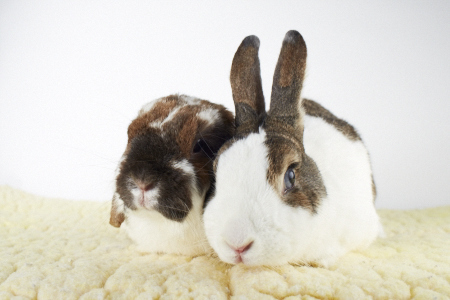 Rosemary(spayed,Holland lop girl) and Jack (neutered, blue-eyed Dutch boy) are a very special bonded, pair of bunnies who love each other very much and must be adopted together. Rosemary is a senior rabbit at 10+ years. She is still full of spirit and is loving life! She loves her "younger man", Jack, who is about 8 years old. They came from a home where they were outside, neglected hutch bunnies and did not get the care they needed. We rescued them and have given Rosemary the medical attention she needed (arthritis and ear infection). Now, it would be incredible if someone was willing to give them a loving,sanctuary home to live out their golden years. We would be willing to help with veterinary expenses if we could find a special place for them. They deserve to be safe, loved and have people treasure them. If these bunnies and their story speak to you, please let us know!